Evesham Rowing Club would like to that all the businesses who have kindly supported our event this year. Our major sponsors can be found below. These local businesses work with us to produce further sporting success for the club and to maintain what we provide to the local community. Please, can I ask you to consider using their goods and services. 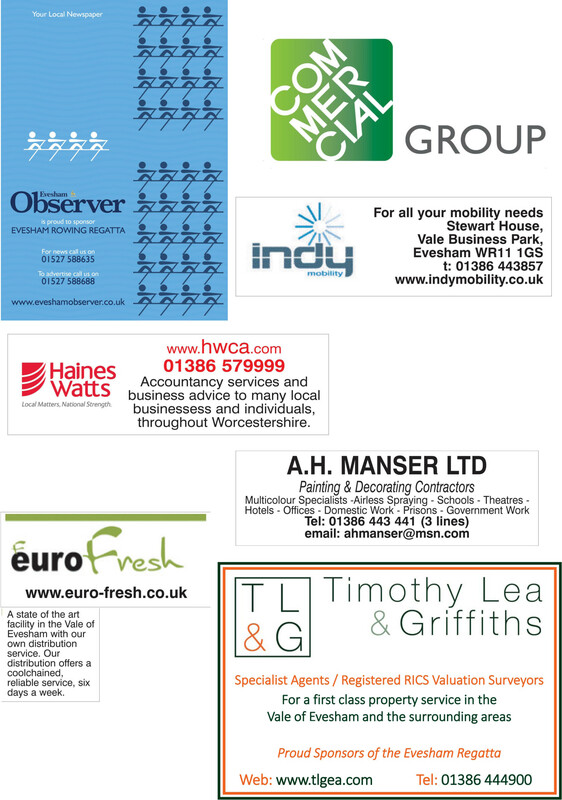 It is only with the help and support from all these local businesses, that we are able to hold our 2016 Regatta. If you contact any of these companies please do say this was via the rowing club. 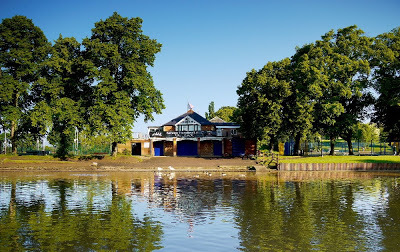 Evesham Rowing Club was started in 1865 by an enthusiastic group of amateurs. Since then there has been an active club on the River Avon, promoting the sport of rowing. Although a relatively small club, we have consistently punched above our weight on the national rowing scene. Even this year, we have seen our past oars people enjoy national success. In 2016, Lance Tredell was stroke in the victorious Cambridge crew in the Oxford vs Cambridge University Boat Race. Lance is also a former Gold medal winner as part of the men’s eight which won Samsun World Cup in Sidney in 2013. Lance followed his sister Yasmin Tredell, who also rowed at Evesham, and is now part of the GB International squad. Last year the Club saw Flo Pickles continue her rowing success, rowing with Gloucestershire Hartpury at Henley in the quad, with another former Evesham Rower, Francis Russell. Liam Tustin, another former Evesham Rower, also won Gold at Henley as part of University Coxed four. Another former Evesham Rower, Luke Towers, managed to win a Silver medal in the Coxless four at the Junior World Championships in Rio de Janiero last summer. Luke is currently studying at Boston University in the USA on a rowing scholarship, he remains a member of Evesham Rowing Club and Molesey Boat Club here in the UK. Alex Gregory, World Champion in 2011, Olympic Gold Medallist at London 2012, Alex remains an integral part of the GB Men’s four, and will again feature at this year’s Rio Olympics. Alex is an honorary life member of Evesham Rowing Club. Zac Purchase, World Champion in 2010, Olympic Gold Medallist at Beijing 2008, Olympic Silver Medallist at London 2012. Like Alex, Zac is an honorary life member of Evesham Rowing Club. These are some of our famous oars people, behind the headlines, there are hundreds of Club oars people, juniors, middle-aged masters and normal ‘sporty people’ who enjoy the comradeship and sporting endeavour which taking part in Club rowing brings. Some of the monies generated by the Regatta help to fund ‘Learn to Row’ courses where members of the public can come and try rowing. Many enjoy the experience so much they go on to join the Club and become competitive oars people. One of the current batch of ‘Learn to Row’ is Jonathan Elabor, himself a former Olympian in downhill speed skiing, he is enjoying the challenge of learning a new sport with its associated skills. Evesham Rowing Club is a multi-sport establishment, we have 6 hard tennis courts and 3 squash courts all enjoying an active social life, which is focused within our unique and beautiful Edwardian Boathouse, incidentally this facility is available for private hire affording functions first class facilities and unsurpassed views over the River Avon. If after watching the rowing you are tempted or feel inspired to ‘have a go’, why not register your interest by logging on to Evesham Rowing Club’s website http://www.erc.club/learn-to-row/ or by phoning the Club on 01386 443161 and leaving a message, someone will call you back, and arrange to come down and see what happens on the River bank! 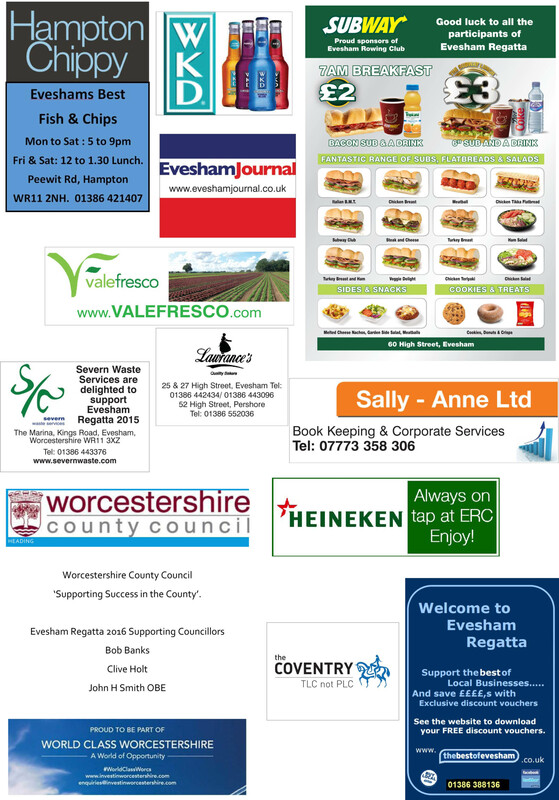 There are many ways that local firms can help Evesham RC and hopefully as many ways we can help them.